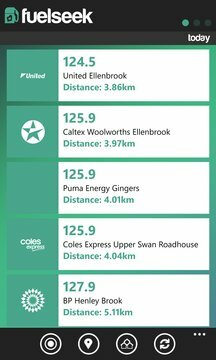 FuelSeek is your number one Windows Phone app for keeping track of fuel prices in Western Australia using up-to-date information straight from the FuelWatch Website! • Select custom fuel, region, and brands; keep your results relevant! • Navigate to your desired petrol station by tapping one of the results; this will launch your phones default Navigation app and direct you right there! 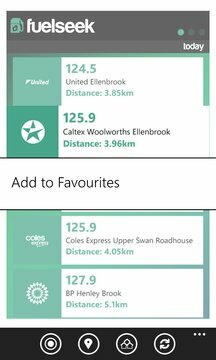 • Add your most visited fuel stations to favourites; see these at glance wherever you are! • Choose your Tile color; keep the default app color or choose your phones accent color!